Kraft, White and a colour! Hope you are having a wonderful weekend or a Mad Monday for those in Australia and New Zealand. Mine is a mad Monday. My son came back from his Italy trip last night. So happy to see him 🙂 He has not stopped talking about his trip. We have thousands of photos to see and more to listen. He has definitely enjoyed the trip. Very happy for him. School restarts tomorrow. I cannot wait for it. Last two weeks of spring break was chaotic but lovely at home. I now need to fall back into routine and also get some me time to restart crafting. I have lots to catch up. I am late in sharing this post for the reasons above. But better late than never! There is a new challenge at A Blog Named Hero Blog. This is a great challenge. I love kraft and white together and a splash of one colour will make the colour pop. This month we are also collaborating with Lawn Fawn. 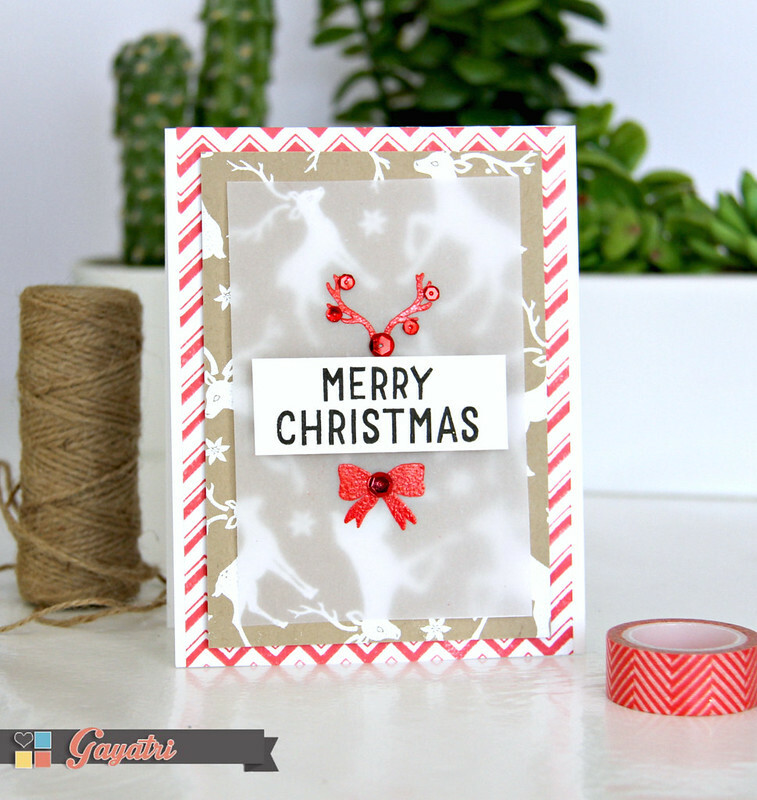 I have used the chevron border stamp set from Lawn Fawn to stamp with Lipstick Red SSS ink to get the chevron background. on white cardstock. For the second layer, I used kraft cardstock and white heat embossed the images from Deck the Hall stamp set from Hero Arts. The third layer is vellum on which I red heat embossed the images from Deck the Hall stamp set and Holiday Petals and Leaves stamp set from Hero Arts. Final layer is the sentiment from Hero Arts Holiday Petals and Leaves stamp set stamped in black on a strip of white card stock. All the layers are adhered using foam adhesives to give dimension. Finally I adhered some red metallic sequins from Pretty Pink Posh on the horns and bow. Here is a closeup of the card. Check out A Blog Named Hero blog for more design team inspiration. 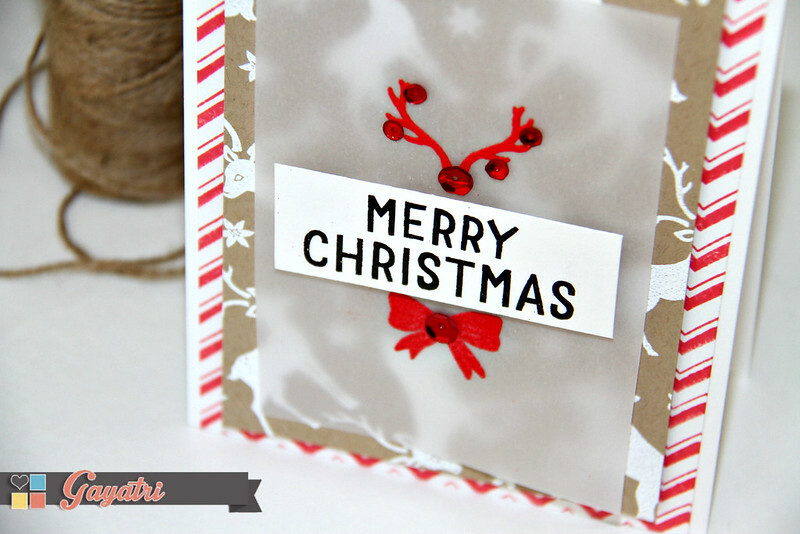 Just love the Christmas red and white with kraft and the velum – so beautiful layered together. Wonderful card, love the red embossing (and so pristine too). Such a lovely card!! Nice choice of colors! !